In the tradition of Tales from The Crypt, Torture Garden, Vault of Horror and Dead of Night comes Ghost Stories. 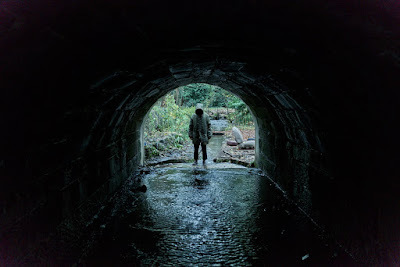 Based on a play by director/ star Andy Nyman the film tells a trio of supernatural tales wrapped around the story of paranormal investigator looking into three unexplained cases given him by a colleague. The first story is about what happens when a night watchman hears weird sounds in the abandoned hospital he is keeping an eye on. In the second a young man is involved in a hit and run in a weird forest. The third section is the story of a soon to be father who has weird experiences in his new home. A mix of horror and humor this a chilly but not completely chilling film. Possessing several creepy moments the film entertains but never truly scares, though it almost always delights. I think the lack of real scares is the result of two things. First if you’ve seen any of the anthology horror films like Tales from the Crypt then you’ve seen versions of these stories. While the film excels at paying homage to the classic films it doesn’t really break new ground of its own except on a technical level. The other problem is that, other than the first story, the film very much feels not that far removed from being a theater piece. Yes, there are some wicked visuals and trippy special effects but at the same time I could see almost everything being done on stage. Things simply don’t feel like its attached to any real world except that of film/theater. Problems or no the film has some great moments. There some really cool things here- none of which I can’t tell you about lest I spoil it . The film also boasts a small but crucial role by Martin Freeman in the final story. I couldn’t understand why he as in the film until it clicked and I suddenly realized why he would take the small role.